Eight companies of riflemen were recruited in the summer of 1776 for the Battalion that was to be commanded by Hugh Stephenson. Hugh Stephenson died in August 1776 and his successor was Colonel Moses Rawlins of Maryland. Henry Bedinger, Third Lieutenant of the company that was to be under the command of Captain Abraham Shepherd, recruited riflemen for the company in Winchester. He recorded a list of the names of men in Captain Shepherd’s Company. The regiment of Henry and Daniel Bedinger was assembled at Bergen, New Jersey. It was immediately ordered up the Hudson River to Fort Lee. 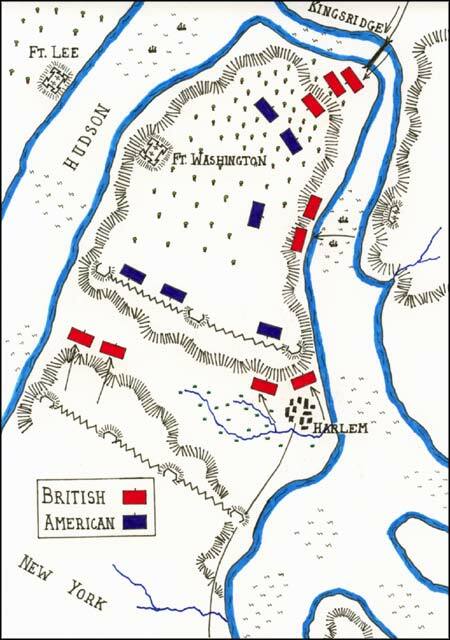 It was then ordered to cross the river and assist in the defense of Fort Washington on Manhattan Island where there were about 3,000 men under command of Col. Magaw. The British approached Fort Washington with a force of 8,000 to 12,000 men and under a flag demanded a surrender of Fort Washington. Col. Magaw replied that he would defend the Fort to the last “extremity”. The Continentals prepared for a contest. Henry and Daniel were in the regiment of Col. Rawlins which was assigned to the defense on a small ridge overlooking the North River. At the break of day the next morning the enemy commenced a tremendous cannonade on every side, while their troops advanced. A few of the Americans were killed by the cannon and grape shot. The Americans fired not a shot until the enemy had gained the summit. Though the enemy outnumbered the Americans by at least four times, the American rifles brought down so many enemy that they gave way several times; but with their overwhelming numbers they at last succeeded in possessing the summit. The overwhelming force of the enemy prevailed and Henry, Daniel and their unit retreated to the defenses inside the Fort. Col. Magaw sent out terms for surrender under a flag. The garrison of Fort Washington consisting of 2673 privates and 210 officers marched out, ground arms, and instead of being treated as agreed upon, and allowed to retain baggage, clothes, and side arms, every valuable article was torn away from both officers and soldiers. The two brothers remained prisoners, Daniel, the youngest, but a few months, and Henry, the elder, nearly 4 years. Both were held in prison ships, with the cruelest treatment, in filthy holds, impure atmosphere, and stinted allowance of food. With such treatment it was no wonder that but eight hundred of the 28 hundred prisoners taken at Fort Washington survived. During the captivity of his brother Henry, George Michael Bedinger would by labor, loans at different times, and the property sold which he inherited from his father, to procure money to convey to the British commissary of prison, to pay his brother Henry board. Then he was released from the filthy prison ship, limited on his parole of honor to certain limits of Flatbush, decently provisioned and better treated; and it is pleasant to add, that the British officers having charge of these matters were faithful in the proper application of funds thus placed in their hands. George Michael made many trips on this labor of fraternal affection. This, with his attention to his mother and family kept George Michael from regularly serving in the army of General Washington. Henry was imprisoned for four years before he was released under an exchange agreement. [i] Dandridge, Danske, 1909, George Michael Bedinger, A Kentucky Pioneer: The Michie Company, Printers, Charlottesville, Virginia, 232 p., p. 25. [ii] Dandridge, Danske, 1909, George Michael Bedinger, A Kentucky Pioneer: The Michie Company, Printers, Charlottesville, Virginia, 232 p.
[iii] Dandridge, Danske, 1909, George Michael Bedinger, A Kentucky Pioneer: The Michie Company, Printers, Charlottesville, Virginia, 232 p., p. 25. [iv] Dandridge, Danske, 1909, George Michael Bedinger, A Kentucky Pioneer: The Michie Company, Printers, Charlottesville, Virginia, 232 p., p. 26.